Make your projects "pop" with an exciting burst of sassy color! 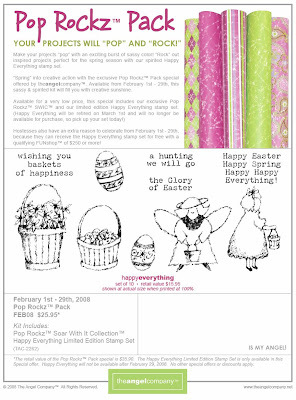 "Rock" out inspired projects perfect for the spring season with our spirited Happy Everything stamp set. "Spring" into creative action with the exclusive Pop Rockz™ Pack special offered by theangelcompany™. Available from February 1st - 29th, this sassy & spirited kit will fill you with creative sunshine. This Saturday, January 26th from 10 am - 12 pm I will be hosting another open house (if you haven't RSVP'd it isn't too late!!). I call it the TAC Catalogue Celebration Party. I have been busy working on projects for this event and have been having so much fun playing with the new stamps and paper and all of my new tools. 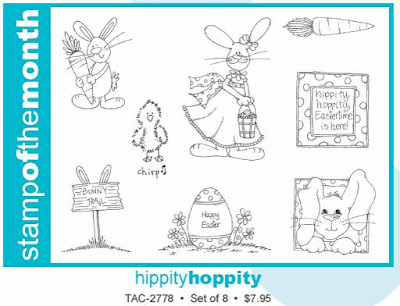 The stamp set that I used is "Love Doodles" which was actually new in the last TAC catalogue but it still seems new to me. I love this set and it is so versatile! It would be great for wedding cards too! Below you can see a closeup of the love panel. Hopefully, you can see the glitter on the heart. I traced over the stamped heart image with the red Stardust Glitter Pen (I really wasn't kidding when I told you that this was one of my favorite products!!). It just adds so much shimmer. Love it!! If you click on the photo posted above, you should be able to enlarge the card and see the shimmer better that way too. The only other stamp set that I used was the Swoops & Swirls Level A Hostess set on the white piece. I really like this set as well and have been using it tons! If you live in my area and haven't RSVP'd yet, send me an email or give me a phone call. It's not too late!! I'd love to have you come! This is an ATC, Artist Trading Card, which means it is very small. In fact the whole card only measures 2 1/2 x 3 1/2. This size could easily be incorporated into a full-sized card at a later time. Sometimes it's fun just to make small cards and then find ways to use them later--kind of like saving them for a rainy day. This ATC uses the "Floral Favorites" set which is new in the TAC catalogue. I love this set! I have been using it like crazy this week, so I'm sure that you'll be seeing more samples on my blog in the days to come (after my Open House this Saturday). This card looks so much prettier in real life too. My camera just couldn't capture the sparkle and glitz that the flowers had after I colored them in using my new **FAVORITE** product (well, besides the scalloped punches) the Stardust Glitter Pens. Wowee!! Those things are FABULOUS!! They have so much sparkle to them. If you like "glamour" or "glitter" you'll LOVE these pens!! You will see several stamp sets in the new TAC catalogue that have this similar look to them. I love them all! They are so SIMPLE and I love simple and quick! All I did was stamp the main image in Claret Palette ink and then used my stardust glitter pens to color in the flowers & stems. The sentiment was stamped with another new set called "Ordinary Greetings" and a ribbon was tied around the image and matted. I used the distresser tool to add the white edge to the pinkish card stock and that was it! I really wish that you could have seen this in real life though. The picture just doesn't capture the real appeal of the ATC. I have so many friends who are expecting babies. And, in case you didn't know already, I am expecting as well (it's suppose to be a girl and she's due March 11th)! So, one of the first sets that I saw in the newest TAC Catalogue that I knew I must have is called "Our Baby". It is a set of 15 which includes the numbers from 0 - 9. It is PERFECT for baby books or scrapbook pages, for birth announcements and for charting what and when your baby is doing certain things. It makes journaling so easy!! 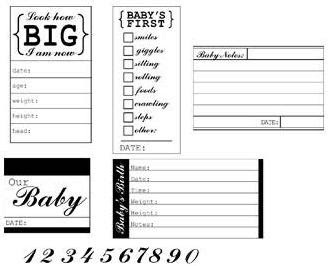 These pictures show a sample of how you could incorporate this stamp set into a birth announcement. The picture at the top of this post is the front of the card. It is actually a matchbook style card! The stamp set that is in the center is from the "Sentimental Boxes" stamp set and the flourishes in the background were stamped with VersaMark and are from the Level A Hostess Set called "Swoops & Swirls". The picture below shows how I used the "Baby's Birth" stamp from this set. You can't really see in the photo, but I used my hot pink stardust pen on the swirls on the right side of the white piece to add a little bling (glitter) to the card. The photo on the inside of the card below is one of my son who is 5 now (and when he gets older he probably won't like that I used his picture on a sample of a girl baby announcement but it's all I had at the time)! This shows what the announcement looks like when it is completely open. This is a fun way to make a baby announcement and could be done in any color scheme. It could also be made into a graduation announcement, wedding invitation, birthday party invitation, etc...The possibilities are limitless! By the way, Nikki from Virginia came up with the template for this matchbook. I want to thank her for sharing her creativity!! Here's another fun project that you can make with your Mega Scalloped Circle Punches! It would make a perfect gift for Valentine's Day--although it is very tiny so you can't fit too much inside of it! Basically it is just two scalloped punches, scored in half, glued together (one inside and one outside), and embellished! And here you can see how tiny this purse is! See the quarter in front of it! One of the new stamp sets that was first on my TAC order was "Doodle Bugs". It is just such a cute set and replaces one that I loved but retired ("Happy Bug Day"). Here's a quick card that I made today using this brand new set (just finished cutting it out last night). The brown background squiggles in this card is also a new set. It is a Level A Hostess set called "Swoops & Swirls" and it has so many possibilities. The words used on this card are from the set called "Seeds of Blessing" which is not a new set. You also see in this photo some pens. OHHHHH my!! Can you say YUMMY!!! The pens are called Stardust pens. These pens are one supply item that should be on everyone's wish list!! They are awesome!! I'm sure going to use them a lot! They are gel pens with glitter!! Yes, a very fine, pretty glitter. Hopefully you can see some of the glitter when you click on the photo to enlarge it but I don't think that the photo really captured the true shine of the image! That's all for now but I hope to show you some more samples using some new sets soon!! It's hard to believe but Valentine's Day is right around the corner! I worked on some projects for Valentine's Day yesterday and I incorporated scallops into each project...you'll be seeing LOTS of scallops from me...they are so addicting and I LOVE them!! This is a close-up of the side of the clip. I used a tag from the Cha Cha papers, punched three holes in it and attached ribbons. This is an easy way to attach embellishments and add a little something extra. I used the square scallop punch to punch the purple square and also used the new scallop scissors to make the bottom of the clip have a scalloped bottom. This next card uses the TAC Catelynne paper, which is one of my favorite paper lines from TAC. It just has such soft and feminine colors in it! The design from the card came from http://www.pagemaps.com/, so if you are ever looking for a layout for a card, be sure to check there for ideas! The stamp set I used is "Love Doodles"--a GREAT set!! I used the Giga scalloped circle punch to punch the half circle out of the patterned paper and the Mega Scalloped Circle punch to punch the light green circle. I stamped 3 hearts with Pixie Dust VersaMagic ink onto the ivory circle piece and then stamped another one on a scrap piece of pink dotted Catelynne paper in Belle Rose Palette ink, cut it out and then attached it with dimensional pop dots. Then, I added lots of sparkling stickles all over the heart!! 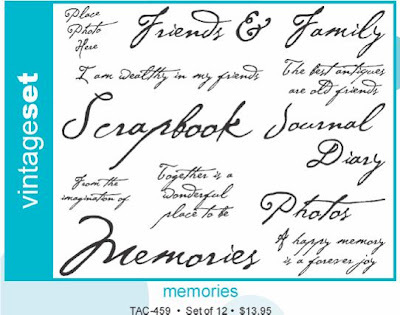 The "love" at the bottom is stamped with VersaMark ink to create the watermark effect. This last card was scanned in so it's a little blurry due to the dimension of the brads and I hope to get a better picture of it later but every picture I took came out orange instead of red, so this will do for now I guess. 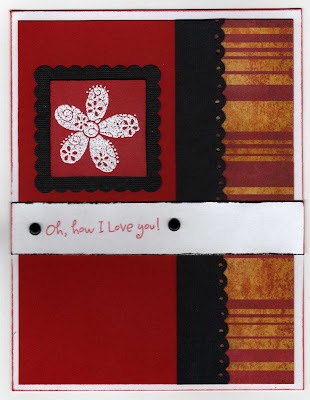 For this card I used the "Oh How" stamp set that is in the new TAC catalogue. I love this set and there are several other similar sets like it also in the newest catalogue. Again I used the square scalloped punch for a mat and then embossed the flower image with a mixture of white & sparkle embossing powders. The strip of patterned paper on the side of the card is from the "Amelia" paper pack (I used this so that you could see how versatile the papers can be with a little imagination!!) For the black scalloped strip I used the scalloped scissors from the catalogue and cut the border and then used a small hole punch to punch holes at each scallop. It creates kind of a lacy look. That gives you some ideas to start you thinking about Valentine's day!! It's only a month and a half away! Wow!! Details will be coming soon for my next Catalogue Celebration Party/Open House!! I am working on projects (like the one I mentioned above) for this event and will let you know what date to save soon!! I'm looking forward to it and I hope that you are too!! The hustle and bustle of the holiday season is already gone for most of us. And...at the end of all those holiday happenings comes the start of a fresh new year! Be ready for all the wonderful creativity, inspiration, and products you will find in the new angelcompany™ Spring/Summer 2008 Inspiration Book & Catalogue by getting organized! No more boring organizer labels and plain containers...take advantage of the amazing organizational stamp sets offered by TAC™ to creatively arrange, organize, and decorate all the things important in your life! Let theangelcompany™ help you maximize your inspiration and minimize your clutter with our special life organizer stamp bundles available from January 2 to February 29, 2008. *The retail value of the Studio and Office Organizer Bundles is $39.90. Retail value of the ULTIMATE Organizer Bundle is $79.80. No other special discounts or offers apply. Stamp sets are commissionable and count toward career rewards points. All stamp sets included in the Studio, Office, and Ultimate Organizer Bundles are only available in the kits listed above and will not be available after February 29, 2008. (Retail Value $19.95) can be yours for a special price! *Net total before shipping and handling and applicable tax. So hurry! This offer ends January 31st, 2008!